This thread is privately moderated by warlikeofchaos, who may elect to delete unwanted replies. The HCP80, the step that I took from v911, my fist CP, the one that allowed me to learn CP and survived. Yes, besides I've got/flight 100s a lot and I'm now taking a step on 450 realms with a Tarot 450 project, I'm still attached to HCP80, I could not let it sit taking dust on a shelf, so I decided to make it live longer. Note: If you plan to buy an HCP80 to make it BL, don't! Just buy HCP100s with the money. 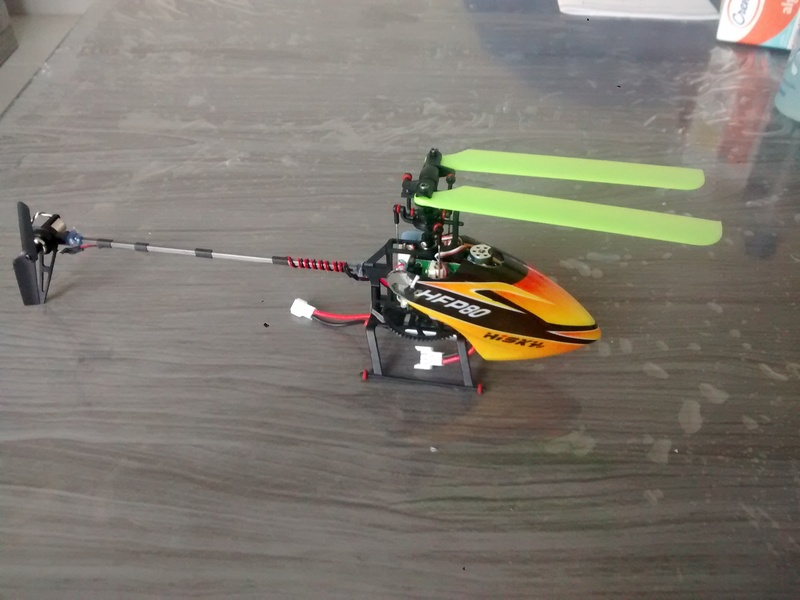 Dadio and Nelicopter made theirs HCP80 BL with an outrunner motor, ahilker made with inrunner. I opted for inrunner cause I don't have tools to make a suport from CF/AL to sit the outrunner. I do not used trainer port (pics how I done on second post). I modified the LG and canopy. I also want to say thanks to Nelicopter, ahilker and dadio who helped me sharing their experiences and answering my questions. Ask me any questions about it. Last edited by warlikeofchaos; Mar 15, 2016 at 05:55 AM. These are the points of solder o MX-3A. You need to reverse the black/red. How I attached my lipo. You need to modify the canopy to allow BL motor to sit. Total height after all mods. Eflight lipos with modified connector. BLHeli Stick with modified connector. Tail from BG, you need to change connector. You need to modify frame to motor sits and proper gear mesh. Use stock HCP80 pinion. Modify the LG to reduce weight and use elastic bands to hold the lipo. How I wired Taranis to HT8. Last edited by warlikeofchaos; Mar 14, 2016 at 04:03 PM.